Among my favorite keyboards these days are Logitech’s $100 Bluetooth Easy-Switch Keyboard K811 and its solar-powered sibling, the $80 Wireless Solar Keyboard K760. Both Bluetooth keyboards let you pair with any combination of three Macs and iOS devices, switching between those devices with a simple keypress. But what if you need to use your keyboard with four devices? Then you’ll want to take a look at Kanex’s $69 Multi-Sync Keyboard. This Mac/iOS-focused keyboard also pairs with up to three Bluetooth devices, but it adds a USB connection for use as a wired keyboard with your Mac (or with an iOS device using Apple’s Camera Connection Kit or Lightning to USB Camera Adapter). Thanks to its larger size (17.4 inches wide), the Multi-Sync also includes a standard numeric keypad, a feature missing from those Logitech models. The downside is that the Multi-Sync Keyboard’s keys aren’t as good as those on Logitech’s offerings. As with the K760 and K811, the Multi-Sync Keyboard pairs easily with up to three Bluetooth-enabled Macs and iOS devices (including the Apple TV) in any combination. To pair the keyboard, you just turn it on, press the desired quick-switch key (F1, F2, or F3, each labeled with the Bluetooth symbol) you want to assign to the device you’re pairing with, and then press the Bluetooth-pair button on the bottom of the keyboard. You then complete the pairing process on your Mac or iOS device. You repeat the process, pressing a different quick-switch key, for each additional device. Once you’ve paired the keyboard with several devices, you choose the active device by pressing its corresponding F-key (F1, F2, or F3). This feature worked well in my testing with a Mac, an iPad, and an Apple TV, connecting with the corresponding device a few seconds after I pressed one of the quick-switch keys. LEDs on the opposite end of the keyboard—an odd placement—confirm these connections. But unlike Logitech’s keyboards, the Multi-Sync keyboard also provides a USB port (specifically, a Micro-USB port on the back edge of the keyboard) for wired connections. Using the included four-foot USB cable, you can connect the keyboard directly to your Mac (or, as mentioned above, to an iOS device with the appropriate adapter), reserving the three Bluetooth slots for, say, iOS devices and laptops. When the keyboard is using USB, the F4 key acts as a fourth quick-switch key for the USB connection. I also tested the Multi-Sync keyboard connected to my desktop Mac over USB and my iPad, iPhone, and Apple TV using Bluetooth. It was convenient to be able to use a single keyboard for all four devices, quickly switching between them when I needed to. Unlike Logitech’s K811, the Multi-Sync Keyboard doesn’t include a rechargeable battery; rather, it’s powered by either the USB connection or by two AAA batteries (included in the box). When I reviewed the two Logitech multi-device keyboards, many readers voiced their desires for a similar keyboard with a numeric keypad. The Kanex grants such wishes by offering the full complement of extended-keyboard keys: a numeric keyboard on the right, a standard inverted-T group of arrow keys; and, above that, the standard pod of Page Up, Page Down, Home, End, Delete, and Fn. There’s also a full row of 15 F-keys that double as special-function keys. From left to right, they are: the aforementioned quick-switch keys (F1 to F4), then Mission Control, Mission Control’s show-desktop mode, screen brightness lower and higher, Previous, Play/Pause, Next, Power/Sleep, volume down and up, and Mute. The last seven of these keys also work with iOS devices; oddly, the brightness keys do not. Worthy of praise here is the fact that Kanex has split this row into groups of four F-keys (F1 to F4, F5 to F8, and so on), making it easier for touch-typists to find the desired key by touch. The drawback to this full-size design is that unlike the Easy-Switch Keyboard K811, which easily fits in most laptop bags, Kanex’s keyboard is better left on your desk. It’s only 4.9 inches deep and 0.7 inches thick at its thickest point, but it’s wide enough and heavy enough that you probably won’t want to pack it for travel. You also get two other iOS-focused keys: a large Home key to the left of the left-hand Control key, and a large Spotlight-search key to the right of the right-hand Control key. Unfortunately, the size of these keys—they’re among the largest on the keyboard—and their locations mean that the modifier keys (Control, Option, and Command) are smaller than normal and in slightly different locations relative to other keys than normal. Perhaps some people would get used to this oddity, but I never could—I regularly hit the wrong key when trying to press Option or Control, often leading to unexpected results. Those who aren’t picky about the feel of their keyboard’s keys will likely be perfectly happy with the Multi-Sync Keyboard. But those who consider the feel of a keyboard to be just as important as its features will be disappointed. The included stand works surprisingly well. Included with the Multi-Sync Keyboard is a fantastic little plastic stand for iOS devices. When collapsed, it’s less than a quarter of an inch thick, 2.8 inches wide, and 3.2 inches deep—small and thin enough to slip into any bag or pocket. But it unfolds into a stand that offers three angles (63, 69, and 75 degrees from horizontal, indicated on the respective positioning notches) and is sturdy enough to prop up even a full-size iPad in portrait orientation. The cradle of the stand is only about a quarter of an inch deep, so an iPad in a bulky case won’t fit well, but the stand otherwise holds any iOS device. 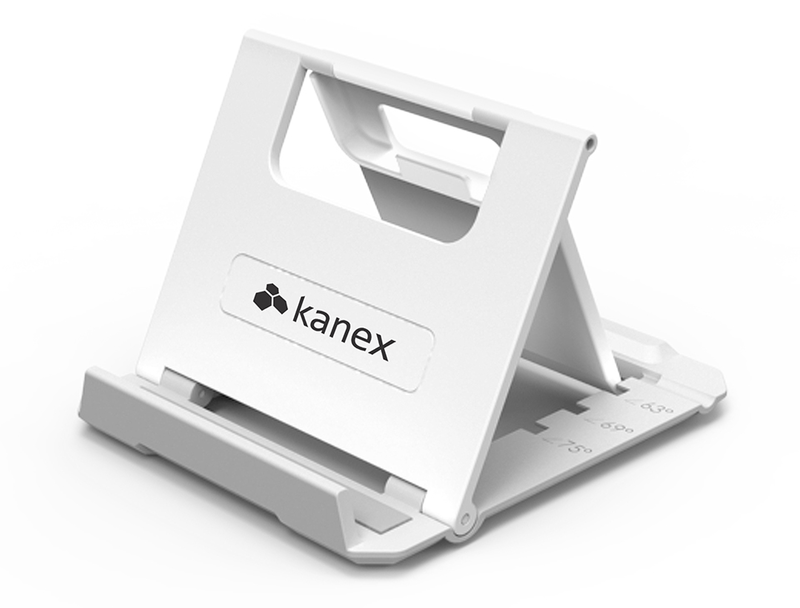 If Kanex sold this stand separately, it would be one of the best portable stands on the market. Like Logitech’s Easy-Switch keyboards, Kanex’s Multi-Sync Keyboard is exceptionally convenient if you’ve got multiple Bluetooth-enabled devices—any combination of three Macs, iPhones, iPads, iPods, and Apple TVs—and want to use a single keyboard for all of them. The inclusion of a USB connection, letting you connect an additional wired device, sweetens the deal; and if you don’t need portability, Kanex’s full-size layout, including a numeric keypad, makes it a nice alternative to the compact Logitech models. However, if you don’t need that extra connection or the extra keys, Logitech’s K811 and K760 offer superior keys for a considerably better typing experience. 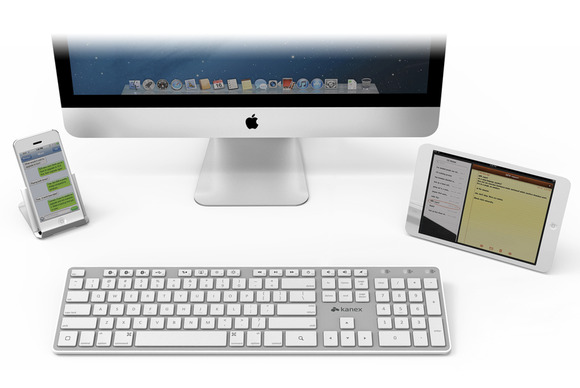 Convenient keyboard connects to up to four devices (three Bluetooth, one USB) simultaneously, switching easily between them, though its keys are a step down from Apple's.